Usually the military plays its cards close to its chest regarding which new tech will be presented to the world during the country’s Victory Day parade, but Russia Beyond has the inside knowledge. For the last several years the anniversary of the victory of the Great Patriotic War has been used to unveil Russia’s new military hardware. For example, in 2015 Russia’s T-14 Armata tank, Arctic tech, and AK-12 machine gun for paratroopers were presented to the world. According to a source from the Defense Ministry, this year the parade through Red Square will reveal the Terminator-2, a Russian combat machine designed to support infantry. “This will be its debut before the eyes of Russia and the world. Before, we tested it in combat in Syria and demonstrated the machine’s firing potential in the closed firing range at the Army-2017 military exhibition. Now the technology is completely ready and perfected,” the ministry source told Russia Beyond. It’s a combat machine equipped with four launching installations for 9M120 Ataka guided missiles, as well as a 30 mm coaxial machine gun capable of penetrating even the toughest modern armor and fortified buildings. The new version of the Terminator is also being tested at the moment, on the T-14 Armata tank’s platform (instead of the T-72, on which it was formerly based) and with the 57 mm AU220M Baikal artillery installation. 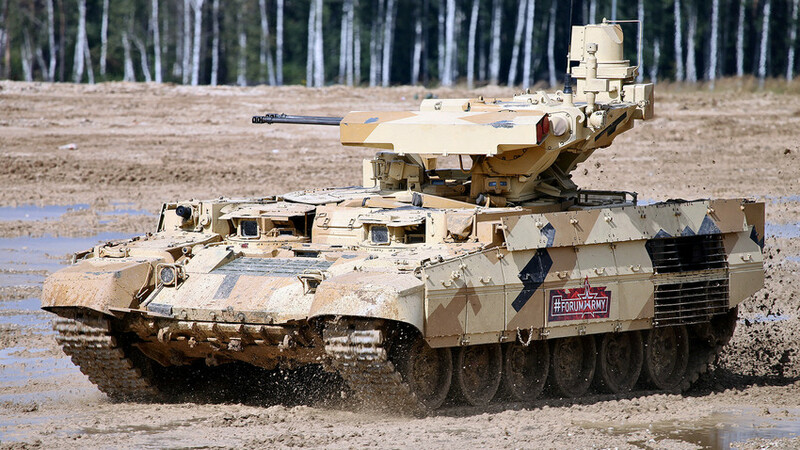 However, it is still not known when this new Terminator will appear in the parade and in the Russian Army. Besides the Terminator, the Tor M2DT and Pantsir-SA missile systems are expected to wow the crowds. The Tor-M2DT is based on the Vityaz all-terrain vehicle and can easily traverse unpaved roads and water barriers. The machine can also function at minus -40 °C. “In practice, the new Tor-M2DT is like a missile system with a ‘trailer.’ It combines a short-range missile launching installation that can shoot down the opponent’s planes and missiles up to 12 kilometers away, and a life support unit that can easily fit up to four people,” said Victor Murakhovsky, editor-in-chief of Arsenal Otechestva magazine. The Arctic Pantsir-SA system was modelled after the same all-terrain vehicle and also has a life support unit. However, this is a missile-gun system that, unlike the Tor, also has a 30 mm coaxial machine gun that can fire 5,000 rounds a minute.